I wanted to share this lovely old diagram — Osborn’s 1909 “Idealized Bird’s Eye View of the Great Badlands of South Dakota, Showing Channel and Overflow Deposits in the Oligocene and Lower Miocene.” First, it is a lovely visualization, in that many disparate elements are depicted, yet it remains meaningful and readable at a glance. 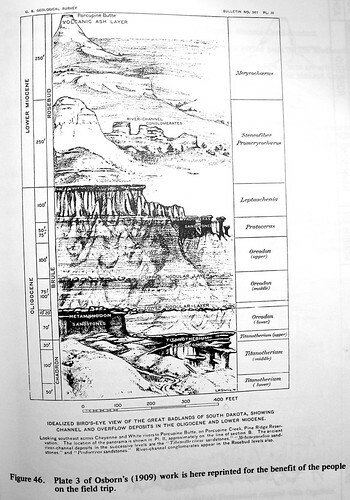 Osborn’s diagram is outdated, but this image is still reproduced in many of the books I have read, because it is helpful in identifying the geological layers. For those who are not familiar with the Badlands area: not all of these layers are visible at any one location. The top layers (above the pinnacles) are revealed in the higher terrain of the Pine Ridge Reservation, and parts of the South Unit of the Badlands. The highest point in the drawing (porcupine butte) is where the KILI radio station and tower are located. The lower mounds in the diagram are not revealed unless you are on the Lower Grasslands level of the Badlands, approx. 2500 feet I’d say, from memory, from White River to Conata Basin and Sage Creek, although again, these formations are on an “incline” and disappear/reappear as you move around the park. At any rate, this is one of the diagrams I’ve found most meaningful. Technically it is no longer correct in terms of dating, but timeline shifts are easy to make in your mind. The Chadron and Brule have remapped to from “Oligocene and Lower Miocene” down to Eocene and Oligocene, roughly speaking. Keep in mind that these materials were “deposited” at the above times, and the dates are based on fossils found within the layers. But the sediment’s origin itself may be elsewhere; materials were transported here by wind (ash) or water (mud/stone). Hope this helps those who’ve asked me, in one way or another, “how old” are the Badlands!